Here at Cambridge Personalised we sell a wide range of personalised name tags that are durable, don’t fade and longer lasting compared to other similar products. We only seller sew in personalised name tags and they are suitable for all types of clothing including nursery and school uniform, our labels can also be used for care home residents. Our personalised name tags are available in several sizes including both 10mm and 25mm, you can personalise them with over 10+ fonts, 20+ solid print colours and 50+ optional motifs which add a special personalised touch to any name tag. All of our labels are fade free and will out last any clothes they are sewn into, we only use super soft double sided satin ribbon which does not irritate the wearers skin whether that be at school or in a care home setting. 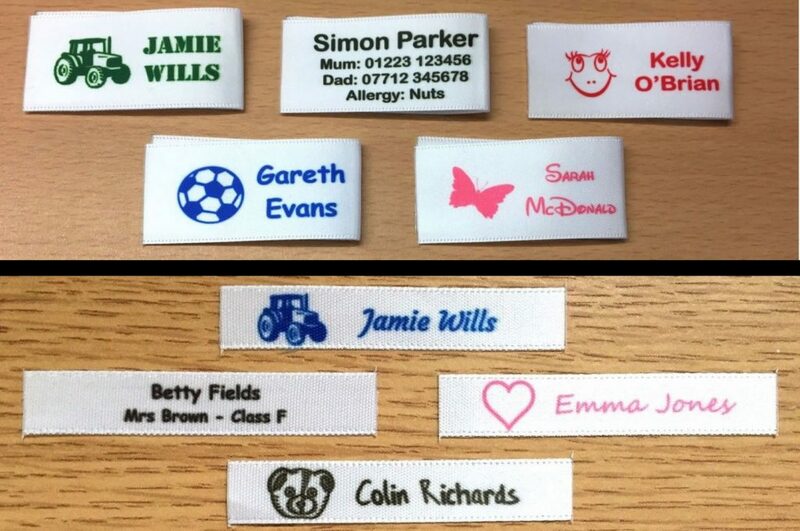 All of our sew in personalised name tags have been thoroughly tested by washing them in both bio and non-bio washing detergent and very hot washing temperatures with no adverse effects, we have even soaked our labels in concentrated bleach without any issues. Whether you use our name tags for school clothes, care home clothing or in your craft projects you can be assured they are durable enough and will do the job. We also cut and seal each name tag for you which prevents unwanted fraying and saves you time, all of our name tags are manufactured at our Cambridge UK production facility using a in house bespoke developed process which is unlike traditional printing methods and gives us the edge. If you would like to find out more about our personalised name tags and labels please follow one of the links below.